English: Gules a lion rampant queue fourche argent. Français : De gueules au lion d'argent à la queue fourchée. Это векторное изображение было создано с помощью Inkscape участником Odejea. Это векторное изображение содержит элементы, заимствованные из другого изображения: Blason Vide 3D.svg. 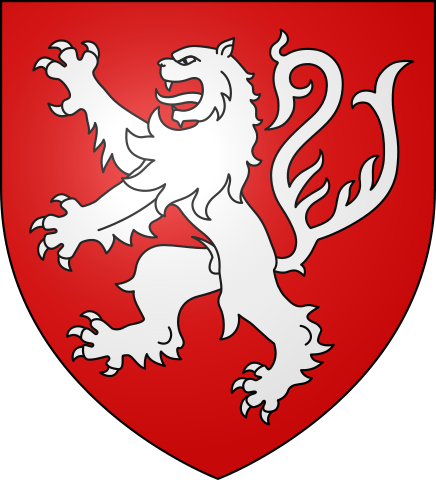 The arms for Simon de Montfort the Earl of Leicester is properly a fork tailed lion without a mane, in red on a white ground (gules on argent) according to the contemporary Chronica Majora of Matthew Paris, in which it is illustrated in color. Brother Matthew knew Montfort personally, a letter sent to Montfort from his nephew John in Germany is bound into the volume of the Chronica Majora, which is in the collection of the British Library. A substantial coTpyright fee is charged by the British Library for use of the image. The white lion on a red ground, often given as Montfort's arms, is an error.